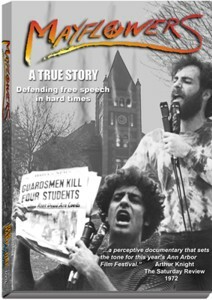 The true story of the student strike for free speech at the University of New Hampshire during the Vietnam War after the Kent State Killings in May 1970. With 40 years to think things over, the original players talk about those charged days. Commentary track with student leaders. Strike Daily, the complete collection, chronicles what happened at UNH when classes and finals were replaced by workshops and community outreach. "What's amazing is how clearly the documentary evolves, peeling the pages of the story and the layers of emotional onion at the same time." We are updating our download delivery system at this time. We appologize for any inconvenience. I own all the gear necessary for each of these endeavors. I am always interested in projects that speak to my concerns and interests, projects that raise public awareness in issues of culture, social responsibility, environment, urban planning and resource management. I also work on feature film production in any number of capacities, and I produce my share of commercial programming from 30-second spots to training films.